Alastair Seeley is returning to the British Superbike Championship this year with the Royal Air Force BMW team. The Carrickfergus rider, who has won British Supersport and Superstock titles, last competed in the premier class in 2012. "I have been there before and know what it takes - I am ready for the challenge," said Seeley on Friday. Seeley will also race on the bike at the North West 200, where he has secured a record equalling 15 wins. 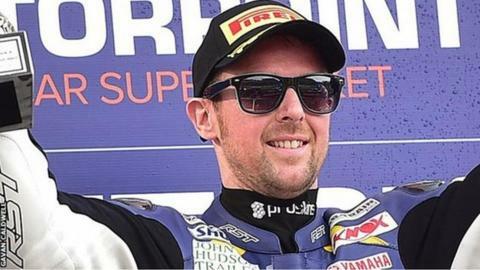 The 36-year-old finished runner-up to fellow Northern Ireland rider Josh Elliott is last year's Superstock series. "It is great to be back in the Superbike Championship, the elite class, again," added Seeley. "I have had some seasons to regroup in Supersport and Superstock and I want to come back and pick up where I left off in 2012. "I have obviously been keeping a close eye on BSB and it looks like it is not going to be easy with the level of riders on the grid and everyone is so close on times. "I feel that my experience on the BMW in the Superstock class will help me this season and I am working with crew that I know already, which is a big bonus for me too."